Join us at the Lenexa Art Fair on Saturday, May 11, at Lenexa City Center. 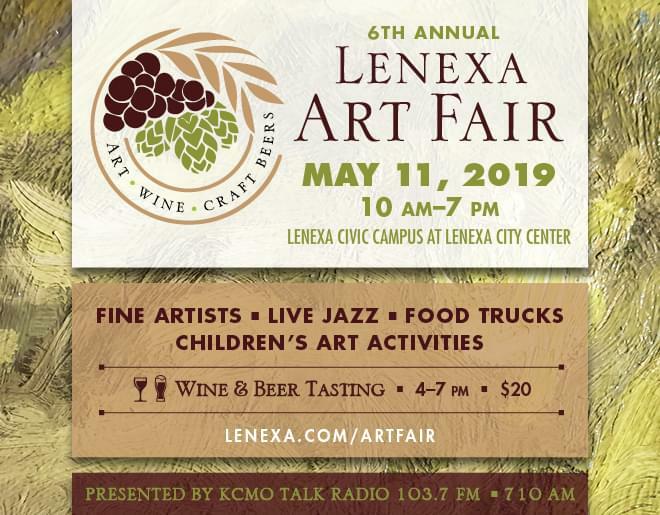 The Lenexa Art Fair on Saturday, May 11, from 10 a.m.–7 p.m., is the perfect outing for art enthusiasts, jazz lovers and wine or beer connoisseurs. This juried event features more than 50 fine artists from the region, a wine and craft beer tasting, live jazz music, food trucks and children’s art activities. The wine and craft beer tasting is a ticketed event held from 4–7 p.m. and will showcase local wineries and breweries. Admission is $20. Purchase tickets in advance at http://www.lenexa.com/artfair. 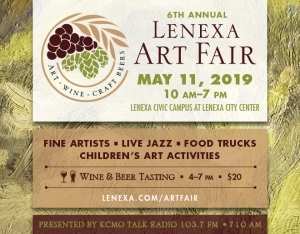 The Lenexa Art Fair will take place on Lenexa’s civic campus at 17101 W. 87th St. Pkwy., Lenexa, KS 66219. This is located at Lenexa City Center, which is west of 87th Street Parkway and I-435.